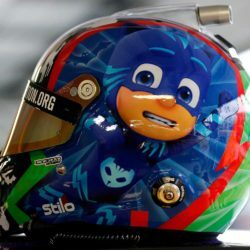 Kyle will wear this awesome one of a kind Halloween Helmet at Kansas Speedway and Martinsville Speedway in the NASCAR Playoffs. Then he’ll autograph the visor and it could be headed your way! But you have to get your raffle ticket before they are all gone! Raffle ends October 31, 2018 at 11:59 PM ET. Only 3,000 tickets will be sold. 100% off the proceeds will go to the Kyle Busch Foundation. 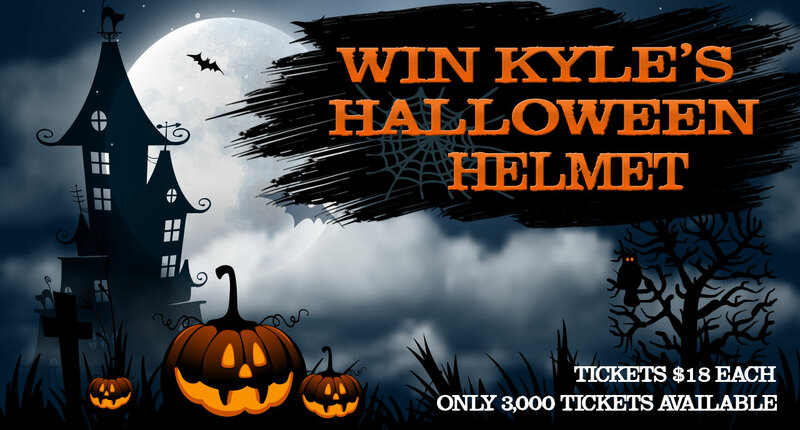 General Description; Eligibility: The “Win Kyle’s Halloween Helmet” Raffle to benefit The Kyle Busch Foundation is offered only in the United States and is open only to legal residents of the United States, 18 years of age or older at the time of entry. The raffle begins at 12:00:00 A.M. EST on October 19, 2018 and ends at 11:59:59 P.M. EST on October 31, 2018. The raffle is subject to all applicable federal, state, and local laws and regulations, and is void in Alabama, Kansas, Hawaii, South Carolina, Utah and wherever prohibited or restricted by law. Employees, as well as their immediate family members (parents, children, siblings, spouse) and others living in their same household, whether related or not, of Kyle and Samantha Busch; Kyle Busch Foundation; Kyle Busch Group, LLC; KB Investment Holdings, LLC; Kyle Busch Properties, LLC; Kyle Busch Retail, LLC; Kyle Busch Transportation, LLC; Kyle Busch Motorsports, Inc.; Rowdy Manufacturing, LLC; Samantha Busch, LLC and any of their representatives, agents, or affiliated entities, are not eligible to enter. By entering, entrants agree to be bound by these official rules and the decisions of The Kyle Busch Foundation, which are final and binding in all matters related to the raffle, the selection of the winner, and the awarding of any prize. Winning a prize is contingent on fulfilling the requirements set forth herein. How to enter: To enter the raffle, please register online at www.KyleBuschFoundation.org by following the instructions set forth therein. Online entries must be received by 11:59:59 P.M. EST on October 31, 2018. For mail entry, please write your name, complete address, daytime telephone number and date of birth on a 3″x5″ card and mail in a business size #10 envelope with payment ($18.00 payable to The Kyle Busch Foundation) to: The Kyle Busch Foundation, Attn: “Win Kyle’s Halloween Helmet” Raffle, 351 Mazeppa Road, Mooresville, NC 28115. Entries by mail must be received by 11:59:59 P.M. EST on October 31, 2018. Winner will be drawn by random drawing conducted by The Kyle Busch Foundation on or about November 1, 2018. All entries become the sole property of The Kyle Busch Foundation and will not be returned. The Kyle Busch Foundation is not responsible for lost, stolen, illegible, incomplete, misdirected, late, damaged, destroyed, or delayed entries or postage due mail. 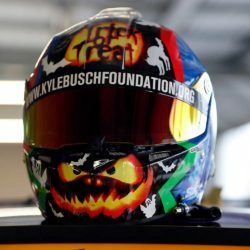 A winner’s list may be obtained by sending a stamped self-addressed envelope to the following address after October 20, 2018 at: Kyle Busch Foundation, Attn: “Win Kyle’s Halloween Helmet” Raffle, 351 Mazeppa Road, Mooresville, NC 28115. Requests received after October 31, 2018 will not be honored. This raffle is sponsored by the Kyle Busch Foundation, 351 Mazeppa Road, Mooresville, NC 28115. Prizes/Odds of Winning: One (1) Grand Prize: Halloween Helmet. Halloween Helmet will be delivered to the winner within 15 business days of October 31, 2018. Grand Prize winner must provide valid driver’s license at time of delivery. All unspecified expenses are the Grand Prize winner’s sole responsibility. Approximate retail value of the Grand Prize is $5,000.00. All unspecified expenses are the winner’s sole responsibility, including but not limited to transportation, hotel accommodations, meals, gratuities, taxes, parking, other travel expenses and any other charges not included in the Grand Prize. Prize winner is responsible for all federal, state and local taxes, if any, and any other incidental expense incurred in connection with the raffle or their prize, except as specifically set forth herein. No prize substitution or cash equivalent of prize except at the sole discretion of The Kyle Busch Foundation. No prize transfer. All prize details are at the Kyle Busch Foundation’s sole discretion, including the date and location of any meet and greets included in the prize. If any portion of the Grand Prize is cancelled or postponed, Kyle Busch Foundation will award the remaining prize components and make no cash payment in lieu of the other component(s). If Kyle Busch and/or a Kyle Busch Motorsports driver is not available for any reason whatsoever, then the Kyle Busch Foundation will have no further obligation to the applicable prize winner and/or guest. A maximum of 3,000 tickets will be sold. Odds of winning are determined by the total number of entries received, with the maximum odds of 1:3,000. Each day entries received by mail and the Internet will be counted to determine if the total sold to date exceeds 3,000. All entries received the day on which 3,000 entries are received will be entered into a preliminary lottery. The first entries drawn from that group up to a total of 3,000 will be included in the final raffle. All other entries received that day (and thereafter) will be returned or refunded. General Conditions: By entering, entrants accept and agree to the Official Rules and the decisions of The Kyle Busch Foundation, which are final and binding in all respects. Winner will be notified by telephone and by certified mail from The Kyle Busch Foundation and will be required to execute and return an affidavit of eligibility, a liability release and a publicity release, where legal, within 10 business days of notification. In the event of non-compliance with the requirements of these official rules, or if the prize notification is returned as undeliverable, the prize will be forfeited, and an alternate winner will be selected. By accepting the prize, except where prohibited by law, winner agrees to the use of his or her name and/or photograph for advertising/publicity purposes without further compensation or notice. Raffle tickets are not tax-deductible contributions to The Kyle Busch Foundation. By participating, entrant agrees to release and hold harmless The Kyle Busch Foundation, Kyle and Samantha Busch; Kyle Busch Foundation; Kyle Busch Group, LLC; KB Investment Holdings, LLC; Kyle Busch Properties, LLC; Kyle Busch Retail, LLC; Kyle Busch Transportation, LLC; Kyle Busch Motorsports, Inc.; Rowdy Manufacturing, LLC; Samantha Busch, LLC and each of their respective parents, affiliates and subsidiaries, and the directors, managers, officers, agents, members and employees of any such entity (collectively, the “Released Parties”) from any and all liability arising from participating in the raffle and/or acceptance, possession or use/misuse of any prize, regardless of whether such claims are founded in whole or in part upon alleged negligence, gross negligence or willful misconduct of any of the Released Parties. The Kyle Busch Foundation reserves the right, at its sole discretion, to disqualify any individual it finds, in its sole discretion, to be tampering with the entry process or the operation of the raffle; to be in violation of the Official Rules, or to be acting in a disruptive manner, or with the intent to annoy, abuse, threaten or harass any other person. Any activities intended to disrupt or interfere with the proper play of the raffle or defraud The Kyle Busch Foundation in any way will be prosecuted to the fullest extent of the law. Limitations of Liability: The Kyle Busch Foundation is not responsible for any incorrect or inaccurate information, including, without limitation, that which is caused by web site users, tampering, hacking, or by any of the equipment or programming associated with or utilized in the raffle or by any technical or human error which may occur in the processing of entries in the raffle. 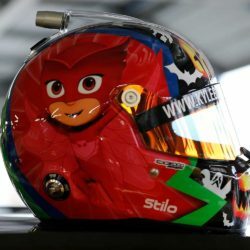 The Kyle Busch Foundation assumes no responsibilities for any error, omission, interruption, deletion, or defection, delay in operation or transmission, communications line failure, theft or destruction or unauthorized access to, or alteration of web site or entries in processing the raffle entries. The Kyle Busch Foundation is not responsible for any problems or technical malfunction of any telephone network or lines, computer on-line systems, servers, or providers, computer equipment, software, failure of email or entrants on accounts of technical problems or traffic congestion on the Internet or at any web site associated with the raffle. The Kyle Busch Foundation is not responsible for user cheating or fraud by any entrants. If, for any reason, the raffle is not capable of running as planned, including, without limitation, unauthorized intervention, fraud, technical failures or any other causes beyond the control of The Kyle Busch Foundation which, in The Kyle Busch Foundation’s sole discretion could corrupt or affect the administration, security, fairness, integrity or proper conduct of the raffle, The Kyle Busch Foundation may, in its sole discretion, cancel the raffle and return/refund all entries or select the winner in a random drawing comprised of all eligible entries received prior to (and/or after, if appropriate) the action taken by The Kyle Busch Foundation. The Kyle Busch Foundation reserves the right at its sole discretion to cancel, terminate, modify or suspend the raffle. A copy of the latest Financial Report and Registration filed by this organization may be obtained by contacting us at: Kyle Busch Foundation,351 Mazeppa Road, Mooresville, NC 28115, 704-662-0000. In addition, residents of the following states may obtain financial and/or licensing information from their states, as indicated. Registration with these states, or any other state, does not imply endorsement by the state. Your contribution is deductible only to the extent permitted by federal law. · Florida: A COPY OF THE OFFICIAL REGISTRATION AND FINANCIAL INFORMATION MAY BE OBTAINED FROM THE DIVISION OF CONSUMER SERVICES BY CALLING TOLL FREE 1-800-HELP-FLA (1-800-435-7352) WITHIN THE STATE. REGISTRATION DOES NOT IMPLY ENDORSEMENT, APPROVAL, OR RECOMMENDATION BY THE STATE. 20-8353637. · Georgia: A full and fair description of the charitable program for which this solicitation campaign is being carried out, and a full and fair description of the programs and activities of this organization, will be sent upon request. A financial statement or summary, consistent with the financial statement required to be filed with the Secretary of State pursuant to Georgia Code § 43-17-5, will be sent upon request. · Maryland: A copy of the current financial statement of The Kyle Busch Foundation is available by writing The Kyle Busch Foundation at 351 Mazeppa Road, Mooresville, NC 28115, or by calling 704-662-0000. Documents and information submitted under the Maryland Solicitations Act are also available, for the cost of postage and copies, from the Maryland Secretary of State, State House, Annapolis, MD 21401, (410) 974-5534. 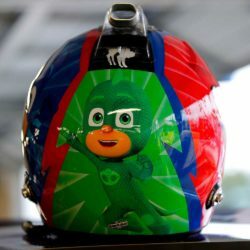 · Mississippi: The official registration and financial information of The Kyle Busch Foundation may be obtained from the Mississippi Secretary of State’s office by calling 800-236-6167. Registration by the Secretary of State does not imply endorsement by the Secretary of State. · New Jersey: INFORMATION FILED WITH THE ATTORNEY GENERAL CONCERNING THIS CHARITABLE SOLICITATION AND THE PERCENTAGE OF CONTRIBUTIONS RECEIVED BY THE CHARITY DURING THE LAST REPORTING PERIOD THAT WERE DEDICATED TO THE CHARITABLE PURPOSE MAY BE OBTAINED FROM THE ATTORNEY GENERAL OF THE STATE OF NEW JERSEY BY CALLING 973-504-6215 AND IS AVAILABLE ON THE INTERNET AT http://www.state.nj.us/lps/ca/charfrm.htm. REGISTRATION WITH THE ATTORNEY GENERAL DOES NOT IMPLY ENDORSEMENT. · New York: A copy of the most recent annual report is available from the Office of the Attorney General at New York State Department of Law, Charities Bureau, 120 Broadway—3rd Floor, New York, New York 10271, 212-416-8401. · North Carolina: Financial information about this organization and a copy of its license are available from the State Solicitation Licensing Branch at 919-807-2214. The license is not an endorsement by the State. · Pennsylvania: The official registration and financial information of The Kyle Busch Foundation may be obtained from the Pennsylvania Department of State by calling toll-free, within Pennsylvania, 800-732-0999. Registration does not imply endorsement. · Virginia: A copy of the financial statement is available from the State Office of Consumer Affairs, Department of Agricultural and Consumer Services, P.O. Box 1163, Richmond, VA 23218, or by calling 800-552-9963 or 804-786-2042. · Washington: Thank you for supporting The Kyle Busch Foundation. For additional information regarding the organization’s activities or financial information, The Kyle Busch Foundation is registered with the Washington State Charities Program as required by law and information may be obtained by calling 800-332-4483 or 360-725-0378. · West Virginia: West Virginia residents may obtain a summary of the registration and financial documents from the Secretary of State, State Capitol, Charleston, West Virginia 25305. Registration does not imply endorsement. · Wisconsin: A financial statement of this charitable organization disclosing assets, liabilities, fund balances, revenue and expenses for the preceding fiscal year will be provided upon request.